As an example, a HBT device structure is shown in figure above, which is created using device drawing tool VisualTCAD. 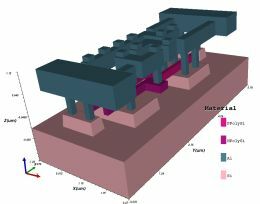 The simulated Ic~Vbe curve for this example is shown in figure below. For the Ic~Vce simulation, the base current is ramped to 1uA, 2uA, 3uA, 4uA, and 5uA, as shown in figure below. Complex Y, Z, H, or S parameters are functions of either frequency or bias. In a Smith chart, the imaginary part of an RF parameter is plotted against the real part. They can be converted to magnitude and phase. Figure below shows S parameters plotted on the smith chart. Please note that S21 is downscaled by a factor of 100.